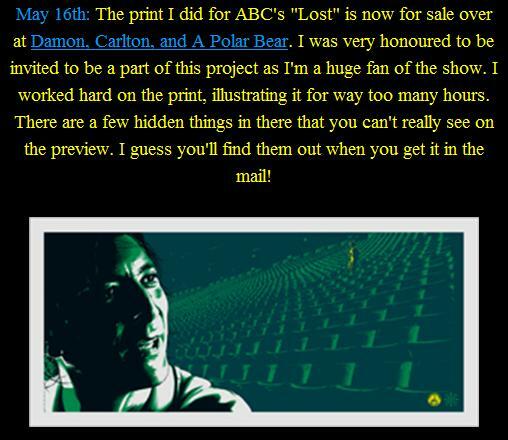 Last night Weinbeeezy mentioned this update from Jeff Boyes that there may be a few hidden extras in the Desmond print. 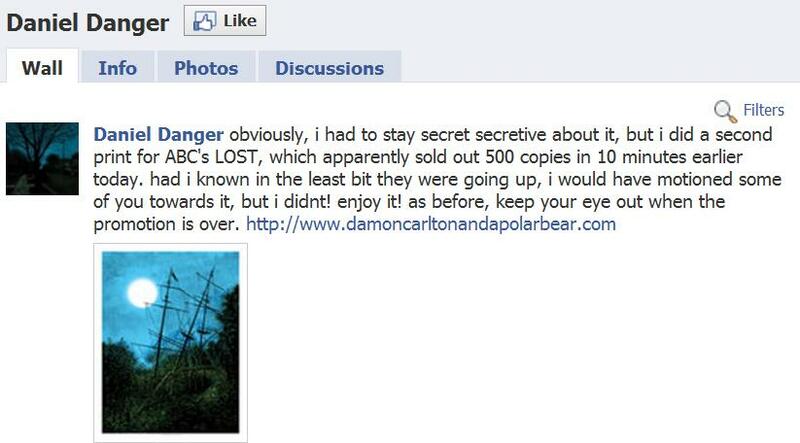 Then we have this small update from Daniel Danger via his facebook page that Ray told us about, and it does hint that, as before, the artists may have a few extra copies for sale at a later date. Pretty curious about what's hidden in the Boyes print... but not interested enough to buy one. Jacob from the last post, posted on EB that it's either olly moss or Tyler stout. If I'm being honest, I'm gonna say it's olly moss. Can't imagine what else stout could do seeing as he's already done an awesome ensemble job. I would get a Stout print if he did a Neil Frogurt print. Montage of Frogurt's entire life story, from birth to flaming arrow in the chest. @ Mark - Hahahahaha... That would be awesome but I would prefer Arzt. Also, have all the prints released at the same time? It's hard to keep up here in Aus. Olly Moss just responded to me on Twitter when I asked him when his print was dropping. He said " I don't comment on rumors or speculation." Morning Weinbeeezy, ioioos, Martyn and all. Another exciting day. here here. Good morning all. I hope I hate todays poster. I don't need to spend any more at all. Good morning to you too, sir! Did you buy yesterdays print, seeing as it had no human figures in it? Except Alpert but he doesn't look human in that poster. Picked up a black rock off ebay in the end. Not looking forward to getting up at 3:30am this time and then probably 5:30am as well if it doesn't drop then. Who needs sleep though right! I sort of hoping it will be a crap one today so it can calm down a bit! Besides, I'm stuck in a review meeting all afternoon! Anyone in the UK willing to text out when our baby arrives?? Have Jensens alerts been timely? I only signed up to them last night. I know that some folks are starting to get their t-shirts delivered. Nice!!! I haven't purchased any yet. Just a quick thought on posters being shipped. I've ordered 4 (Jacob, Lost Live-Jack, NP'sB, & Black Rock) and depending upon what the last 4 are... we'll see. Will be 1:08pm in in Helsinki soon. ioioos. email me your number chris dot leaning at gmail. Can't promise as I have a heavy afternoon too but if I can I will. ioioos & ChrisL - I'll do the same for both of you. Include Twitter & FB accounts if you have. Yeah, my brain serves me well! I can help out if you want. What's the best way to get in touch with you? I will have the phone on vibrate, and if it drops, it will help give me the excuse to rush out of what promises to be a very dull annual review meeting with a cleaning and catering company! I'm really torn as to what I would like to see. A Tan of Jacob & MIB would be cool, and a Moss of Smoke monster would probably have a nice twist. I would love to see Jay Ryan have another go, as I love his work but I think he got a poor lost subject first time around. Another Todd Slater would be cool too. ioioos at mail dot com! Good morning all...Just caught up with posts. @ioioos - The link I posted last night is NOT part of the DCaaPB series. I guess it classifies as fan art. Branden Otto did the LOST diptych of "Just Progress" and "The Candidates" a few weeks ago. He mentioned he would be doing a finale print then. Phew! I was worried I had just found out the answer the the biggest Q.....the love triangle! @ioioos I would never intentionally spoil anything for anyone. I just get really excited about cool LOST stuff and want to share. My enthusiasm is a bit of a character flaw...pesty perky girl. I didn't think you'd spoil something for a second. It was only after I was over analyising the thumb nail that I saw Kate cozying up! Whew, just got back in from work ahead of 1:08. Even though I can't afford it after buying yesterdays, if there's a Tan one I will happily break the bank for it. @ioioos I could´t find her on the pic you´re talking about, where is Kate there? ...the time they post the prints, I mean! Hopefully it's safe to say that we survived 1:08 GMT without a print release! Only a billion more 1:08s to go. lol yep, I'm afraid to go out anywhere ! I guess it will be 1.08 EST again as first time was 1.08PST twice? Or 10.8? 1.08am? 1.08pm Tokyo time? Sidney? Roswell, I'm afraid not, we are at BST at the moment not GMT, that has still to occur ! Just passed another "It's 1:08 somewhere" moment. I'm beginning to feel the anxious churn of last summer/fall returning, especially now that it seems good ol' Daniel Danger got a bunch of people back on board. At least last year we usually had a time from a clue (although not knowing anything re: time does keep the vultures away). Ah well, I really shouldn't buy another one anyhow. The wallet and the wife are both screaming at me. I'm also curious to see if anything can top The Black Rock, too. That is a phenomenal piece. I think it wouldn't be crazy to assume 1:08pm EST again. I´m confused now, what is BST? So what time is it in the UK now? is it because of summer/winter time or something? I'm assuming thats Kate off centre to the right with someones arms wrapped round her? Hard to tell. Okay I just checked the BST, UCT, GMT thing. So if it´s 1.08 GMT it will be in a bit less than an hour, right? Right it's a little after 13:25 in the UK and I'm off to watch Iron Man 2, they don't mind people using cell phones in the Cinema right ? If this is an Eric Tan or Olly Moss poster I would appreciate someone picking it up for me. I don´t read spoilers so maybe there´s a reason for that? I´d also really appreciate it if anybody could get one for me if it´s Eric Tan, Olly or McCarthy and/or if either Sawyer or Juliet (or both) appear on the print. Also if it´s something related to the lighthouse with Jack, or the cave with the names. I´ll be off having lunch if the reveal is at 1.08 GMT so won´t be able to get it. Would there be anyway that someone could commit to buying me today's print, whatever it may be? I will be in the middle of the woods today and will not have access? Let me know. nealflesner@gmail.com - literally about to drive to the middle of nowhere CA to work with an american indian tribe today. I will send an extra program to you from the lost live experience. I don't think it will go on sale until later, EST time. I dunno how long it'll take me to get home tonight but if I get there fast, I can probably help someone out as a poster buddy. If you could please help me out.....I would really appreciate it. Please shoot me a quick email and I can forward you my address, etc. Site locking up, just like the old days! Not having any trouble here. Just to note- it is only 6 am in California. They'd have o be very dedicated to time equality to do it now. Since it's Jensen who is putting these up this time on his own, not tied to any events around the world, I imagine it'll PROBABLY be during a time when he's at the store, but who knows? If anyone needs a buddy today, let us know! I did not say it was either Moss or Stout. I said I can confirm that it is at least one of those two....meaning I know for sure about one of them, but the other is possible as well. As for the print itself...all I can say is that it does not focus on any specific character. AL- lots of folks above have asked. Any confirmation you can order more than one? More than one at a time? man i hope its moss! his tweet to weinbeeezy makes it very likely! So are we pretty certain that the print will be released on the 8th minute of an hour? @Jason I thought so until yesterday! @Mark Englert, I'm pretty sure it was supposed to be 1:08 yesterday. The page loaded for me about 2 minutes late. The drop not being consistent makes me a bit nervous about it. They could post the prints any old time they want! Luckily, my job involves sitting here for ridiculous amounts of time, anyway. @Mark, yup, desk jobs are great for DCAAPB! The site is lagging for me. What about you guys? Ok, sorry! Olly Moss OR Tyler Stout. Thanks for the high res. Something to drool over while I'm on lunch. Mmmmm, Black Rock! 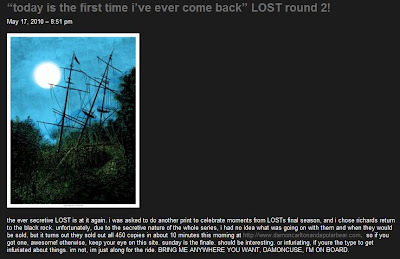 "Oh and just to remind you all, tonight is the 2nd to last episode of LOST! It's the best show on television, so you should make sure you check it out". Coming up on 10:08 EST. I'm really hoping people don't post ANY kind of spoilers in these threads after tonight's episode.. We don't get the episode til Friday in the UK. In other news, I have an unavoidable meeting in a half hour or so that will run a good couple of hours. I promise to check back in as soon as I'm home, but can someone poster-buddy me please if it's a big drop? I'd be really grateful. That is one thing that worries me about this project. If we keep up the 1 poster a day rate, the last poster drop would be before the finale. So hopefully none of these have any spoilers. But I'm guessing they probably wouldn't have shown the finale to any of the artists anyway, so I guess we should be okay. Haha. 108 dollars. How appropriate. 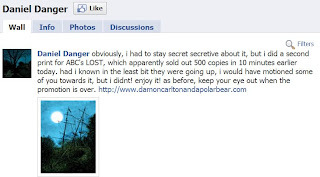 @Capostar - For some reason, I don't believe there will be many imitators cause most people know that Lost is a very unique show that CANNOT be replicated under any circumstances. since flashfoward is abc , i can forgive...a little. But there i've noticed many shows trying to simulate that "Lost-suspense". With orchestra music that rises to climax and an abrupt black screen. Wanna laugh? See Bold and the Beautiful or Ghost Whisperer. BTW, i dont "watch" those shows, I happen to stuble into them... yeah. I guess FlashForward was vaguely similar to Lost but I believe it should be respected as it was practically a show on its own and didn't really follow the same guidelines as Lost did. I believe that Damon said once in an interview that he felt sorry for show that were high budgeted sci-fis as they would be compared to Lost, even though it was a different show. Hi, film finished and it is very good. Loved the appearance of a certain DCaaPB related music man, completley unexpected. Coming up on 1:08 PM in the Atlantic Ocean. 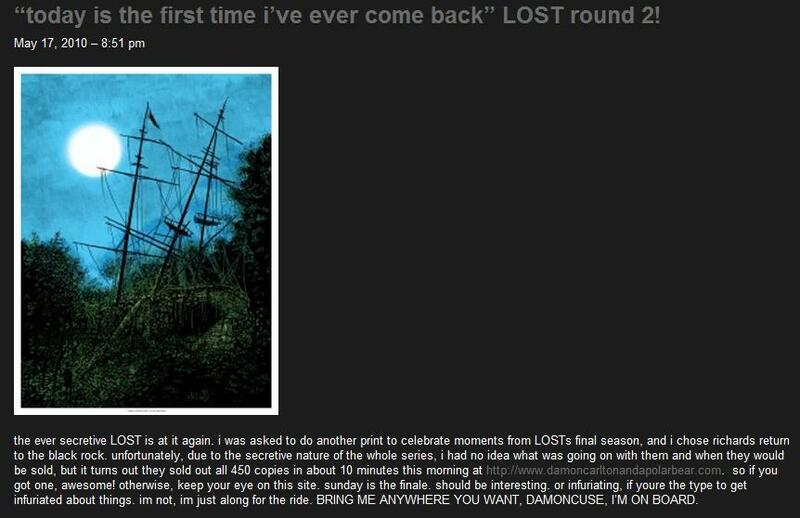 Happy Last Tuesday LOST Day! boo-hoo! Have seen tonight's episode at Lost Live, you guys are in for a fantastic episode and you will not be disappointed! Have fun waiting for the next poster drop! *Yawn* This feels like forever. Ok - so now I have the same problem as last night... About to head home so out of the loop for an hour or more. Lots of people looking for buddies today I know but... If anyone could keep an eye open for me I'd appreciate it. Hopefully a later drop though. Fingers crossed. Chris, I'm here for the next hour to an hour and a half before I head home. Cool ioioos. Thanks. See you later guys. Good luck to everyone if it drops. GRRR! I'm so busy at work this morning, I hope the new print drops AFTER my morning rush... Morning every one! After missing one of my top three artists yesterday because I couldn't be at the computer, I will make up for it today by hitting F5 for seven hours to see the reveal of today's print--Unknown Artist for "Zoe." I'm wearing my Ben "Trust Me" shirt today in honor of the LAST Tuesday for new LOST eps... And also for luck in case the print that drops today is worth shelling out for. IT'S UP! OLLY MOSS FOR "JACK'S TATTOO"
Amy Lynn you just gave me a f'ing heart attack! Tyler Stout for Island light. I'd love an Olly that focuses on the Lighthouse mirrors. Or just mirrors. Or just the lighthouse. Or anything. Maybe they will set the artists up again....? This has the potential to go down as one of the most unproductive weeks I've ever had/will have...sitting here waiting for random poster drop! It's at least up there with some of the unproductive weeks I had during TLE! It's nice to have this to check on, everyone else I know is playing Red Dead Redemption! I have another meeting tomorrow morning, so I hope we don't get a pre-lunch reveal on Wednesday. I would also like to see Ken Taylor for "Ilana Trained Her Whole Life For THIS?" @mistershow So, everyone thinks seeing the origin of Jacob and MIB ruined the show, but Tina Fey with a rifle is fine, just fine? 20 min until the first US 1:08. Okay so its probably going to be another former artist today right? Then two new ones, then two old ones - last one probably being someone incredible like Olly. The drop on saturday is going to be the worst - people are away from computers on saturdays! @Mark THANK YOU! Serious, it's crazy how most people just FAIL at LOST... barf. Fourth: Start the process of filling the gaping Lost-shaped hole in your life by buying stuff! 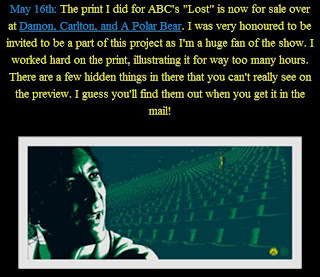 Click over to Damon Carlton and a Polar Bear to find some cool new posters and T-shirts that have gone on sale. I’m also told that the site will be giving away tickets for a pair of fun (and funny) Lost-themed variety shows produced by the Upright Citizens Brigade that will be held in New York and Los Angeles on Saturday nights. More details to come. I've been checking on my Droid all morning and althogh it loads slower, it still works well. I was able to purchase Tyler Stout for LOST via my iPhone + wifi during the last run. Got through just fine! @Weinbeeezy - I'd always go for the comp over the phone... 3G is good, but nothing beats wifi or a straight connection to a router... Is your comp not fast or something? That's impressive--I would never try to order on my iPhone. Just too slow. I've ordered on my iPhone before, but only on drops where it doesn't matter if it takes me 5 minutes to type. I had no choice - thought I had no chance but ended up with a real clean checkout. Just log in ahead of time, type out your cred card number and copy it ahead of time, then wait for the print to drop. Also, there probably is going to be one day without a drop, since there are more days until the finale than posters left. What weird updates from the last couple days did it have before the drop? I'm not having any issue loading. I hope there will not be a drop on Sunday so I can just concentrate on the finale. I wouldn't mind the posters wrapping up by Saturday. Leaving us all hanging for a day would be torture. I wonder if they won't skip today altogether because the show is on tonight. Guess its not ET today. Weird. My cell (which is official time, as it's on satellite) says 1:09 now. Your cell needs updating... go to http://time.gov for official time. "The Incident" by Eric Tan, up now!!! Mark is Sleepy by Jay Ryan is up now! this is sure to trigger a poster drop! so jensen posts updates on his twitter? Shep Fairey for What About You? Shep Fairey for the Island is an evil corporation and causing global warming. Home. So is everyone covered for this one. Do we have a list of anyone who wants but isn't around? Hope you obeyed the speed limit Chris! They should release the next print at 9:08pm EST / 8:08pm CST! @CreedFeed, the chance of that is about zero. So... could it be 1.08 CST then? Or maybe no release today as we´ll already be getting our LOST "reveal" on tv? Anyone want to be a LOSTblog.com poster buddy? i am going to try and grab an extra or 2 to help ppl out if i do i will let u guys know. Ahh, you are in Germany. That explains how you can down tools so easily at the end of the day! How about Rob Jones for Broken F5 key? Can't be said in blogs! On train home, enjoying watching the mayhem! Good luck to you all if it drops in 20 minutes! I had to doubletake when I saw him. no ioioos... in the good old UK but I like the German speed limits. Shall we have an Olly today folks? Of course, you don't have to be in Germany to honor the German speed limit, lol. Many of us are honorary Germans on the freeway. as a reminder of this time we all spent together. Well I can see my absence didn't affect the poster drop...guess it only works when Zort is away. Will drop when everybody's tired and lets their guard down for 1 sec. New Yorkers, keep your eyes peeled! Apparently, there are LOTS of LOST actors here for the week doing press!